In Texas, It May Have All Come Too Easily For Rick Perry : It's All Politics As Texas became more Republican, Perry, the state's longest-serving governor, never had to work out the political muscles that could have helped him in a presidential run. 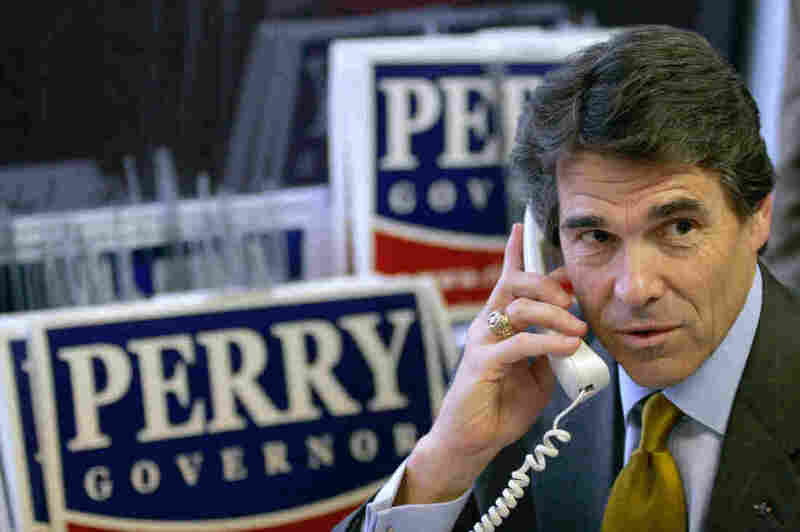 Rick Perry phone-banking during his reelection campaign as governor of Texas in 2006. There was evidence of the problems that lay ahead in his presidential campaigns in those days in Texas. The seeds of calamity for Rick Perry were sown years ago in the fertile political ground that Texas became for the Republican Party. Perry suspended his campaign for president Friday evening, becoming the first candidate this year to get out of the crowded race for president. It was his second failed bid for the White House after leaving as Texas' longest-serving governor. But his 14 years as governor, and the ease of his reelections in what became a heavily Republican state, may have been the worst thing that could have happened to Perry. He did not have to do the kind of work that could have better prepared him for the rigors of a presidential campaign. Rick Perry looked straight out of central casting. If anything, he was getting better-looking as he grew older. And he had a swashbuckling personality to match. When the longtime popular leader of the largest Republican state jumped into the presidential race four years ago, he shot to the top of the GOP polls. Even though he got in late in the game, in August 2011, Perry looked poised to topple Mitt Romney, the former Massachusetts governor, who found himself down double digits to the man who appeared to be his polar opposite in so many ways. Everyone knew the Texas governor was a friend to business, and corporate America reciprocated his years of loyalty by opening wide its wallet. Not only was Rick Perry a contender, he was the clear front-runner! And with that, millions of dollars began pouring into Perry's campaign war chest. Presidential material, meet Rick Perry. But almost immediately, his mouth began to get him in trouble. Trying to burnish his conservative bona fides in Iowa, the Texas governor ripped into Federal Reserve Chairman Ben Bernanke. Perry appeared to suggest that if Bernanke kept "printing more money," he might meet with a violent response should he ever visit Texas. "I dunno what y'all would do to him here in Iowa," Perry grumbled, "but we would treat him pretty ugly down in Texas." Perry's veiled threat took veteran Texas political observers by surprise. Even Texas Republicans were mortified. If the Fed Chairman were ever to grace the gilded homes of the Dallas elite, he'd likely be served a big plate of BBQ, a Shiner Bock and perhaps a pointed discussion about the dangers of runaway inflation while he enjoyed his brisket. But be ugly or rude to him? That's not Texas. The governor wasn't off to a good start, but that was OK, he'd catch his stride, Texans reassured each other. But he never really did. He came across as flat and uninspiring. At times, he would act a little goofy at the podium. After one particularly poor appearance in New Hampshire, the governor was forced to deny that he was drunk. Perry later admitted that he wasn't quite himself during the campaign because of complications from back surgery. It wasn't just that Perry forgot the name of the third federal agency he wanted to abolish if he were president, it was the long drawn out comedy that ensued as Mitt Romney and the debate moderator, CNBC's John Harwood, tried in vain to help the governor remember. It was a Saturday Night Live skit come to life, and it's unlikely George Washington himself could have survived it politically had he been in Perry's shoes. In that moment, Rick Perry's ambitions to be president of the United States were over. He just wouldn't know it for another four years. Republicans around the country had seen all they cared to and a pair of horn-rimmed glasses wasn't going to change that. Perry began his career in the mid-1980s as a Democrat in the Texas House of Representatives. As the state began to move to the right, so did Perry, changing parties in 1989. He then rode atop a massive GOP wave as it washed across the Lone Star State during the next decade. When Texas Gov. George W. Bush was elected president in 2000, Lt. Gov. Perry moved over into the still-warm seat. And there he would stay for the next 14 years. By taking the easiest path to reelection time after time as governor of Texas, Perry was depriving himself of the skills he would need to run for president. As the years passed, and Texas grew ever more Republican, Perry put less and less effort into his reelection campaigns. There was no need: if you had an "R" beside your name in a statewide election you couldn't lose, which is true to this day. To the outrage of the Texas' newspaper editorial boards, he stopped giving them interviews; he didn't care who they endorsed and didn't mind if they knew it. Debates with his Democratic opponents were kept to the barest minimum. There was plenty of money to buy the best political advertising talent in the business and let them do their thing. But by taking the easiest path to reelection time after time, Perry was depriving himself of the skills he would need to run for president. When he avoided the editors at the Dallas Morning News and Austin American Statesman, the governor wasn't fielding tough questions from knowledgeable sources. He didn't develop a broad catalogue of go-to answers for tricky "gotcha" questions or learn how to deftly pivot when presented with a topic that wasn't his strongest. He didn't perfect his debate skills by sparring with his political opponents on television repeatedly. Rick Perry didn't have to work out and develop his political muscles to win in Texas — so he didn't. It was a pleasure to rub Texas Democrats' noses in the reality that they were so hopeless he barely had to try. But as every high school football coach in Texas will tell you, it's not always the most talented team that wins, but sometimes the squad that's put in the hardest work. And while it may be true that Perry was never going be the next Republican Barack Obama on the campaign trail, turning undecided voters into starry-eyed supporters, there was no reason for him to be as surprisingly hapless as he proved to be.